NASA has officially picked three winners for a design contest that asked participants to design a futuristic habitat that astronauts could use to live on Mars. NASA’s 3D-Printed Habitat Challenge Design Competition’s first prize of $25,000 was awarded to Team Space Exploration Architecture and Clouds Architecture Office for their unique “Mar’s Ice House” design, which features an icy and smooth looking pyramid design. According to the design team, the pyramid design would provide an effective radiation shield against the harsh Martian climate. The Mars Ice House’s ribbed interiors and exteriors glow with diurnally determined hues at various times of sol (Martian day). 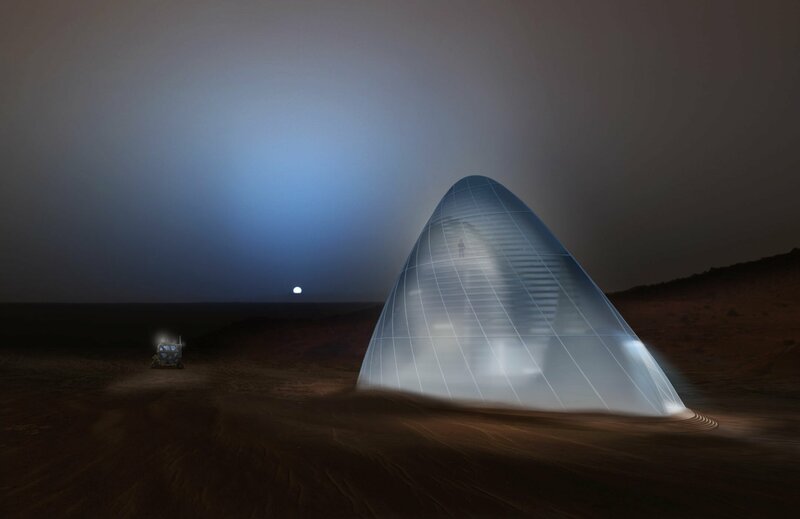 In one illustration from the team’s proposal, the outer shell is washed in Mars’ inky blue sunset, and in another it looks like it was dipped in the tea-tinged pink of the high noon on Mars. The architecture encourages solitary reflective contemplation to nurture the long-term psychological well being of its inhabitants, according to the team’s proposal. More than 165 submissions were received for the contest, which is part of NASA’s Centennial Challenges program. The 30 highest-scoring entries (which you can learn more about here) were judged and displayed at Maker Faire in New York City on Sept. 27, NASA officials said. The design contest is the first milestone in NASA’s 3D-Printed Habitat Challenge, an effort to encourage the development of technologies that could enable dwellings to be built using 3D printers and locally available resources on Mars and other locales away from Earth. Putting boots on the Red Planet is NASA’s top long-term goal in the field of human spaceflight. The space agency aims to accomplish this ambitious goal sometime in the 2030s, and it’s working to advance a number of technologies in addition to 3D printing to get the job done. For example, NASA is developing the Orion capsule and Space Launch System megarocket to help get astronauts to deep-space destinations, and it’s working on new systems to land super-heavy payloads softly on the Martian surface. And the agency’s next Mars rover, which is scheduled to blast off in 2020, will carry a technology demonstration designed to generate oxygen from the Red Planet’s carbon dioxide-rich atmosphere.